When you walk into the Rosemont Bakery and Market at 559 Brighton Ave the smells of freshly baked bread and simmering soups immediately greet you. On one particular day, I walked by the inviting counter filled with The Rosemont’s daily sandwich and pizza specials and the cooler of take-home specialties, and around the back to the tiny office where I spoke with Lisa Childs, who explained to me the significance of the market’s location. “This used to be Piscopo’s Bakery,” she explained. Piscopo’s was a well-known and well-loved bakery in Portland that provided baked goods for local events and wholesale customers. How fitting that it should continue as a bakery. 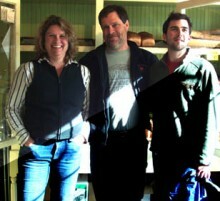 John Naylor and Scott Anderson (co-owners of The Rosemont) worked together for many years at the Portland Green Grocer. Their talents fit hand in glove to create a business – Scott is a baker and John’s interest is in the grocery and wine areas. Lisa, Scott’s wife, previously a stay at home Mom, was eager to add her talents to the project as well. – “Look at this wonderful, space to cook and bake!” gestures Lisa as we take a peek out into the busy kitchen. They found the location, re-designed the retail space and opened in January of 2005. The second Rosemont Market location, at 96 Main Street in Yarmouth, opened in January of 2007. In addition to Scott’s ever-changing selection of artisan breads, and the daily lunch specials, the Rosemont specializes in a specially selected variety of unique wines from around the world; an extensive case of local and international cheeses; a cooler stocked with gourmet meals-to-go; and a storewide focus on locally produced foods. Monthly wine tastings are held on various Friday nights and are posted on boards outside the store. With the cumulative food industry experience among the partners adding up to 60 plus years, the Rosemont market is a world class operation, but “we’re keeping the small, neighborhood feel”, says Lisa as she heads out of her office to greet a regular Rosemont customer at the checkout counter. Rosemont Market and Bakery is a new WMPG underwriter for 2008 on Friday morning’s “Shaken and Stirred” program. 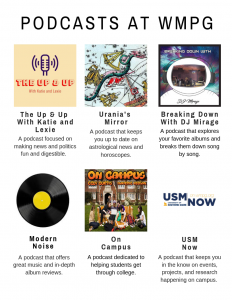 Please let them know you heard about them on WMPG!